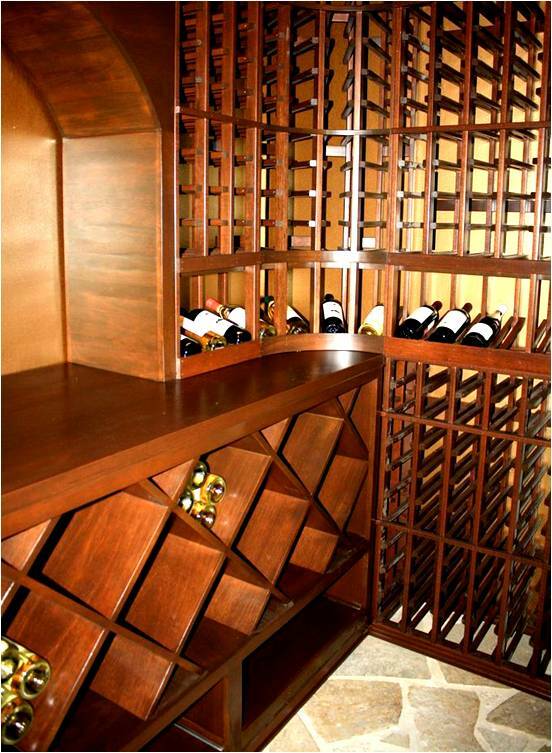 Traditional, original, and totally functional, describes the Chevis home wine cellar. We started with the drawing. Each elevation is designated with a letter – elevations A, B, C, and D. The overhead view shows our first challenge. A duct for the air conditioning system to the adjoining room was found in a wall space that we removed on the left to make our space wider. To use the space, we needed to make the ducting as inconspicuous as possible. We built custom ducting, making it shallower but wider, and as close to the ceiling as possible. We framed around it. We designed the room with curved corners on a double-deep section of the lower back wall, allowing a tabletop across the entire back. Elevation A is the left wall. Here you can see where we added a solid wood piece in front of the hidden ducting. We added a hand-carved grapevine design at the front. The rest of the wall is individual racking for 750 size bottles, along with a row high-reveal display. Dimmable lighting was installed above the display. A rail for the ladder is shown in the upper area. It is attached to a 4-inch solid wood panel. We used 4-inch crown molding, and standard 1 ½-inch base molding. Elevation B is the back wall. The solid horizontal display rows of the top center are large enough to store magnum bottles. The solid arch includes the puck light. LED lighting is also above the display rows on each side of the arch. Double-deep solid diamond bins are included just below the tabletop. The case storage is on rolling shelves, the right to our double-deep, and the left to single-deep. Here was another challenge: at the back of this wall, a vent protruding through the floor to the exterior of the back wall. We built a wooden wall around this as well, and hid it behind the left case storage. The ladder rail goes across at the top, attaching to the 4-inch solid section. Elevation C is the right wall. The fan coil or evaporator for the ductless split wine cooling system sits behind the grill cover and box at the top of this wall. Another ladder rail, individual 750 bottle storage, and a high-reveal display row with lighting, make up the rest of this wall. Elevation D has the two half-high curved corners that sit on top of the tabletop. 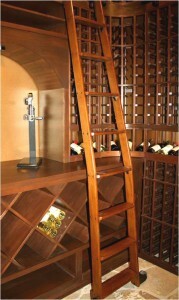 A curved display row with lighting is included in this wine rack. Here are the 3D photos of the room. 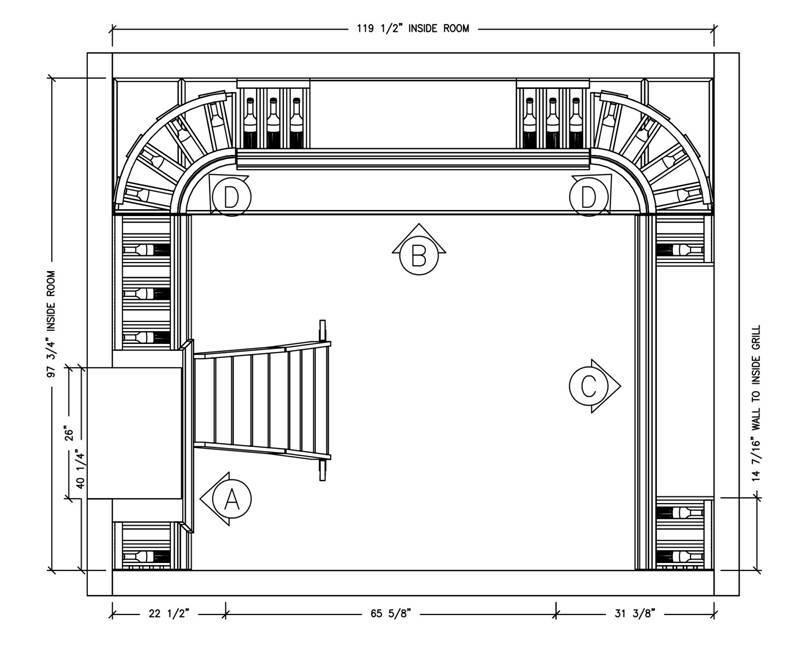 This is the overhead, the left and back wall; the back wall, and right wall; the custom-designed door with surround; and the full wine cellar view from the front. It’s now time to show you the finished product. The front door is in mahogany with chestnut stain and lacquer with heavy distressing. 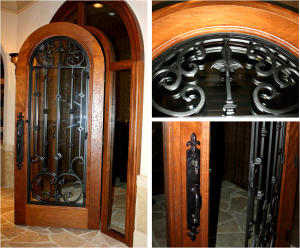 It includes operable wrought iron, and an automatic door bottom. 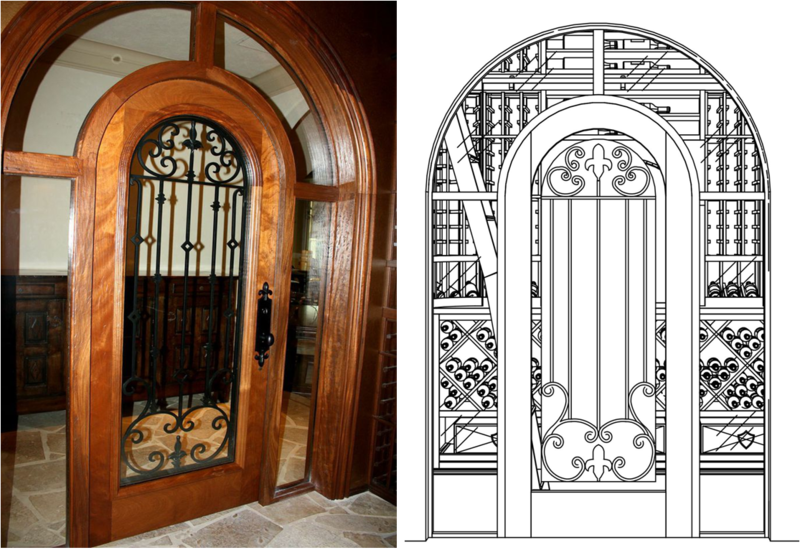 The design for the iron on the wine cellar door was drawn up with input from the owners, and help from our design team. Totally custom-designed with two fleur de lis, swirls, knots and diamond shapes. The door handle set is our St. Charles pattern that also includes the fleur de lis design. Here’s a close up of the handle set and lock, as well as showing how the iron is operable, and opens for easy cleaning of the dual-pane glass panels behind. Here’s the close up of the iron at the top of the door. 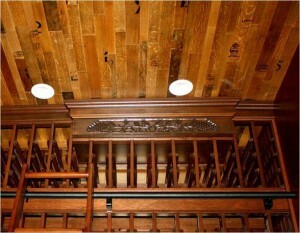 Inside the custom wine room, we added Cooperage reclaimed wine barrel flooring panels to the ceiling. The left wall shows the carved wood section that hides the intruding ducting from the next room. The rails are attached to the 4-inch wood section that is included in each of the wine racks. The ladder is mahogany with chestnut stain and lacquer. The individual bottles continue onto the curved corners. The racks are also mahogany with chestnut stain and lacquer. The corner sits on top of the tabletop, which is above the double-deep bottom section. The upper part of the back wall includes solid horizontal display rows that will fit magnum bottles as well as 750s. The ladder is a hook ladder. It can be moved to any other three walls. The ladder is also a bent ladder to be able to work well with the double-deep back wall section, as well as the side walls. The ladder has contemporary-style wheels. The double-deep bins and case storage are also solid mahogany. The case storage is on rolling shells for easy access to both the front and back cases. The right back side shows the high-reveal display rows turning the corner. The grill cover and box hide the evaporator coil. There’s another rail ladder below. The lower right wall is all 750 racks with a display row, and LED dimmable lighting above. This is a look to the outside of the Dallas, Texas residential wine cellar from the inside. The Chevis custom wine cellar combines luxury with practicality, making it something the owners will enjoy for many years to come. 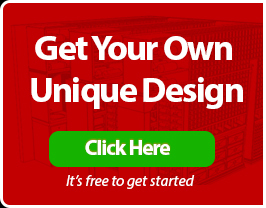 For a beautiful custom wine cellar your home, call Wine Cellar Specialists today.